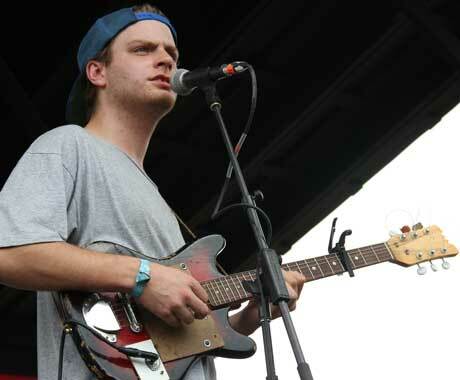 Alberta-born, Montreal-based Mac DeMarco seemed to live up to his "slacker rock" label when he rolled on to the tiny Sonic Stage Sunday afternoon to declare that he was hungover and had slept in his car, but quickly got the crowd on board. Lighting up a smoke and launching into "Cooking Up Something Good," DeMarco had the exhausted Sunday afternoon crowd bouncing along, back for more after his small stage, late Saturday night set. Given only half an hour, DeMarco managed to roll through a decent chunk of Rock and Roll Night Club and 2, including crowd pleasers like "Ode to Viceroy," "Freaking Out the Neighbourhood" and "Baby's Wearing Blue Jeans." There was a snippet of "She Don't Like Cocaine" thrown in there too, and his bassist (sporting an Eric's Trip t-shirt and Jurassic Park trucker hat) stepped in with the screaming on the band's "Blackbird" cover. As seems to be his tradition, DeMarco closed the set with "Still Together" and hopped into the crowd only to emerge entirely drenched in sweat. For a short set, he still brought his A-game, delivering high energy in about as intimate a setting as you can get at a festival this size.